I’m sorry the quarterly newsletter is a little late (though still within the season), but the last three months have been head down at the desk and fingers at the keyboard completing the third draft of the typescript of For Love of Country ready to send to Penguin Books at the end of July. It was all done, I’m glad to say – and thankfully so, because I’ve just heard that publication has been brought forward to next April … four months earlier than originally scheduled. With my editor, Suzanne Wilson, happy that the manuscript’s in pretty good shape, the book’s well placed to meet the deadlines for copy editing, design, setting, cover, printing, distribution and so on. My next step will be the photo selection (we’ve a generous allowance in the contract) and I’ll be getting the material together over coming weeks to send down for the production team to look at. There’s a wealth of photographs from the archive of the soldier-settler family I’ve written about, some of them going back to the mid-19th century. The difficulty will be to decide what to leave out. I’ll leave that problem with them in Melbourne, however, as we’re going to England for a month in September-October to celebrate our Golden Wedding with Jill’s family. They weren’t here when we married 50 years ago (it doesn’t seem that long if you say it quickly) and it will be good to have the anniversary with them. Another reason to have For Love of Country on schedule. Mother’s Day: The book was first planned to come out next August in time for Father’s Day. But with another tidal wave of commemorative Great War books already listed (to say nothing of the tsunami planned for Anzac Day) the risk of our being swamped was acute. It was decided to bring publication forward to May, and then to April to meet the Mother’s Day market. 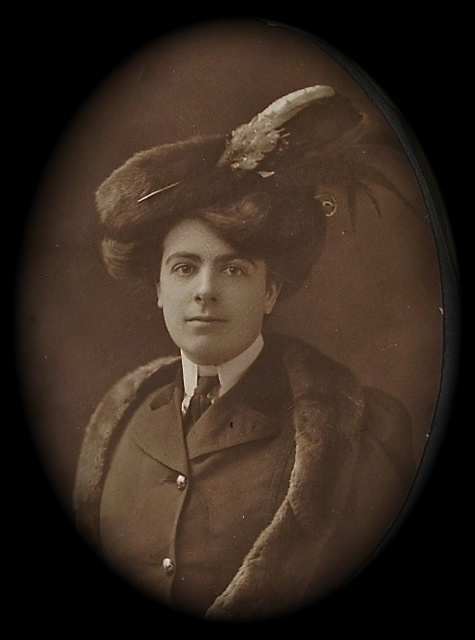 For Love of Country is all about family, and particularly the pivotal role of the mother, Marion, whose strength and determination held them all together. I sense the publicity will largely focus on her, and I’m pleased with that. It’s not only true to the story, but it’s been some time since I wrote a book with a strong central female character, and this will help to restore the balance. Editing: Suzanne Wilson’s response to the manuscript has been very positive and encouraging. Suzanne has been involved with most of my important books over the years, and I’ve come to trust – indeed to rely upon – her judgment. If a passage isn’t working for her, then it needs to be fixed. The main work in this third draft has been cutting back on some of the extended military history from the First and Second World Wars, or at least of seeing it from the family’s perspective, and to constantly keep the main characters in focus. Not hard work, but solid and very necessary. With so much research involved in this significant period, it’s easy for an author to be sidetracked down interesting but irrelevant byways; and we all need an editor like Suzanne to guide us back. Publisher: The other news from the past few days is that my publisher, Andrea McNamara, is leaving Penguin to become a consultant within the industry. It was a bit of a jolt I have to say, for every author also needs a trusted publisher to hold the hand. But it’s a splendid opening for Andrea, and of course we’ll keep in touch. I’m deeply grateful for the support she has given to the book. For Love of Country has had its ups and downs in the journey thus far. Andrea as Associate Publisher picked it up when it seemed to be languishing, with the advice of editor Adrian Potts; encouraged the book’s completion, and saw it through the contract and pre-production phases. And of course she has the in-house team in place at Penguin to deliver it through the press and onto the market next April. I’m very much in her debt. Anzac Day: In the meantime you may care to read an article here I posted which will give a reliable clue to the subject of my book. On the Centenary of Anzac Day I went to the service not at the Australian War Memorial in Canberra, but rather to a suburban RSL at the Yamba Sports Club, which stands on the site of the farmhouse built by my soldier-settler family. It was in fact called Yamba, and I’m very glad I went there, for I felt their presence strongly. Two English oak trees planted by Walter and Marion still stand outside. It’s possible, indeed, that we may launch For Love of Country there next April. *Photographs of her parents when young, courtesy Pamela Yonge. World War One, a history in 100 stories, is written by Bruce Scates, Rebecca Wheatley and Laura James. It is due in October. This writing life never has a dull moment. Even as I was working on the third draft of the current book, came news from Penguin that the Children’s and YA edition of Young Digger has gone out of print. It was something of a blow, as you might imagine – softened by the prospect that Penguin may reissue the book in a new format and with a new Introduction specifically for the adult market. It’s still under consideration, and I’ll let you know when I hear the outcome. It is of course still available as an eBook here. 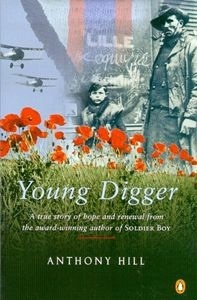 Meantime, I have 15 copies left of Young Digger available on a first come basis until stocks run out. The price is $20 each plus $8.50 postage (for which I apologise, thanks to Australia Post). Please contact me direct if you’re interested at anthony@anthonyhillbooks.com to arrange payment by PayPal, credit card or direct debit. Certainly I hope that that Young Digger is given a new lease of life. For one thing, Penguin is publishing a major work later this year World War One, a history in 100 stories, in which the entire front cover is a photo of Digger with his guardians Tim and Ted Tovell. There are pointers to my book, and it would be strange indeed if it were now to disappear from the list. Moreover, of all the books I’ve written this is the one that has stayed most closely with me. I guess it’s the father: wanting to see this little French war orphan safe … to get him home and give him a new start away from the horrors of the Flanders battlefields and the deaths of his own family. 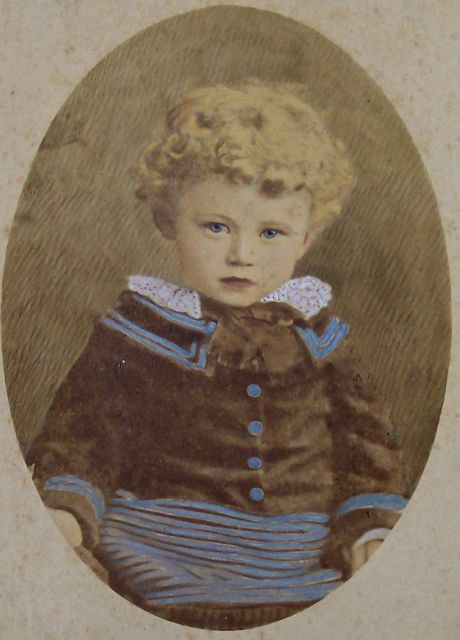 Unknown: We still don’t know who the boy they called Henri (or Honoré) really was. We don’t know his full name, or where he lived in northern France. When you’re four or five, home is just home, and Mum and Dad are just called Maman et Papa. They don’t have names. I know people have been trying to discover these things in recent years, but purely for myself I hope they don’t succeed. We have an Unknown Soldier of the Great War. In many ways I think Young Digger has come to represent the Unknown War Orphan: one of the tens – the hundreds of thousands of children left homeless and orphaned around the world by the horrors of war. The book was first published in 2002, a companion book to Soldier Boy, and has since gone through six printings selling over 24,000 copies. It was shortlisted for the NSW Premier’s History Awards. So Young Digger has done well, and I accept Penguin’s view that the book has probably reached the end of its run as a book for schools and young readers. Adult appeal: Yet the tale has also crossed widely into the adult market. In many respects I’ve always felt the principal themes are adult ones. Certainly the great adventure of these 4th Squadron airmen smuggling the boy home in 1919 appeals to young people … getting him on board ship in an oats sack, and then in a wicker basket with the sporting goods. He was the Squadron’s little mascot. But the motivations of love, risk and nurturing – of something good coming out of the ashes of the Great War – are essentially adult ones. And consequently I think it would do well in the wider market. For Young Digger is also one of those stories that doesn’t really seem to end. From time to time photographs some to light from albums and archives that nobody really knew about. David Daws’ photos here are an example. And the tale so appeals that people feel moved to act and carry the story a further step forward. The 2009 dedication of a new gravestone to Henri in Melbourne’s Fawkner Cemetery is a case in point here. So is the reconciliation of the Tovell family with the RAAF on that day Edith Lock (Edie) spoke at the graveside … and Young Digger’s adoption as a key figure in the re-formed 4 Squadron’s story. 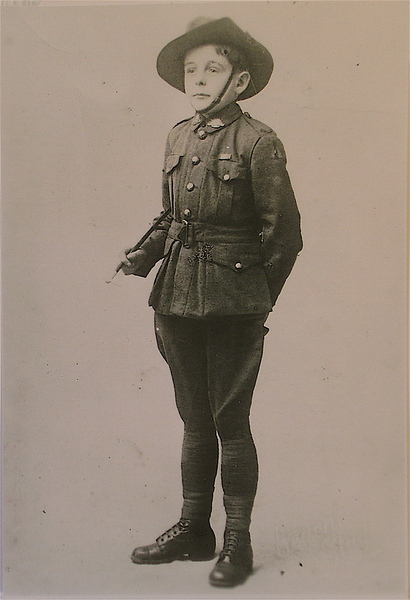 Trumpeters’ Corner: Only recently has come news that a plaque in memory of Henri will be unveiled next Anzac Day at Trumpeters’ Corner in southern Queensland, between Warra and Jandowae out from Dalby. Readers will recall that it was to Jandowae that Tim and Ted Tovell came home with Young Digger on their return from the War. I’ve been invited to attend the ceremony, and at this stage we plan to go. More on this later in the year. 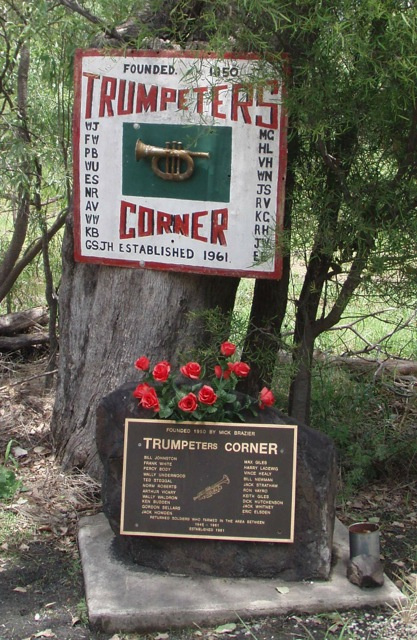 For those who may not know, Trumpeters’ Corner does not in fact commemorate brass bandsmen at all. Rather it refers to a group of 21 Second World War soldier-settlers in the district who used to meet in Jandowae’s ‘pink pub’ on sale day for a drink and many long yarns: ‘blowing their own trumpets’ as the phrase has it. The name stuck. Trumpeters Corner on the 9-mile stock route crossroads was established in 1961, and a memorial stone, sign and plaques have since been erected. There was even a tin trumpet. It’s a significant site in Henri’s story. Digger. Jandowae. And the pink pub was built by Tim Tovell. Many thanks to Des Underwood, Coordinator of Friends of Trumpeters’ Corner Committee within the Warra Progress and Heritage Society Inc. for sending me the invitation and the photograph. One of the joys of this job is the network one creates with people and memorabilia from all facets of life. I was recently contacted by someone who has a fascinating painting of what appears to be the town of Sandakan in North Borneo, during the Second World War. Sandakan, readers will recall from The Story of Billy Young, was near the infamous labour camp of that name where over 2,400 British and Australian POWs died. Bill Young was interned there until his escape (and quick recapture) in 1943. He was held for interrogation in the cages at Sandakan’s Kenpeitai HQ. And he was sent from there to Kuching and the appalling Outram Road prison in Singapore. ‘If only I’d stayed at Sandakan,’ he used to think, ‘I’d have been all right.’ In fact he would probably be dead. Today he’s still wonderfully alive at 89. 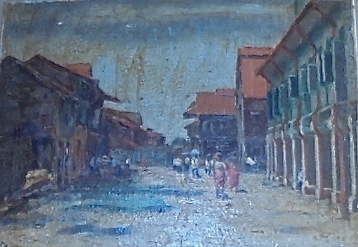 The oil painting discovered by my correspondent shows a street scene typical of many Malayan towns of the period. Red roofed buildings with high gables, Chinese ‘shop houses’, people standing (one apparently with an umbrella) in a street. The picture is quite dirty (in part from an unsuccessful attempt by a previous owner to clean it) and many of the figures are indistinct. But there appears to be a group of soldiers in the middle distance, one of whom the present owner thinks may be Japanese judging by the headwear. 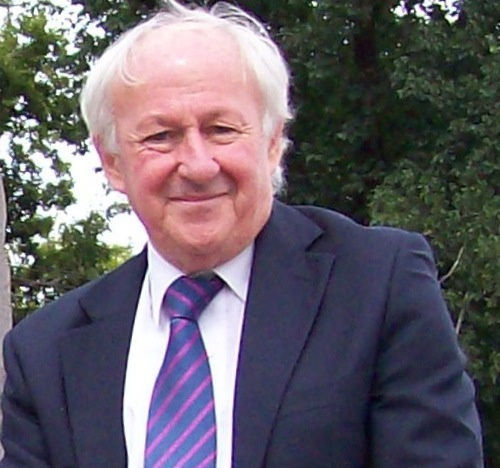 Bill Young does not particularly recognise the scene. But on the reverse of the canvas board is an inscription saying it was framed by R Hook at Hobart in 1947. It also states ‘Jalan [street] Liga Stino 3, Sandakan N. Borneo’, which suggests the place shown in the painting. If it was painted during the war it was evidently done before the Allied bombing of the town in 1945. What gives the painting added interest is the suggestion it may be a wartime ‘intelligence work’ … that is, an innocent-looking picture which in fact indicates a potential place of interest to Allied operatives. In this scene, for example, a small yellow flag on a building to the left as you look at it may indicate an important piece of intelligence information. The owner says that inspection with a magnifying glass reveals the impression of a radio operator. I’m not knowledgeable about this aspect of wartime intelligence gathering. But it’s worth making further enquiries. If any newsletter reader is able to shed light on the likely purpose of the painting, or the scene and time depicted, I’d like to hear from them, and will readily pass the information on. Congratulations to Sofie Laguna who won this year’s Miles Franklin Award with her novel The Eye of the Sheep, published by Allen & Unwin. Others on the shortlist were Sonya Hartnett Golden Boys (Penguin Books), Joan London The Golden Age (Random House), Christine Piper After Darkness (Allen & Unwin), and Craig Sherborne Tree Palace (Text Publishing). The Children’s Book Council of Australia Book of the Year winners will be announced later this month. I’ll give details in the Spring newsletter. I will refund any excess postage if multiple books are purchased.